We tend to like to think that we are aware of everything going on around us; after all, we are conscious human beings, and we notice changes to our surroundings, right? In this post, we’ll look at a phenomenon of human consciousness that is subtly affecting the way we actually see the world - and the way in which users look at your website. Experiments like the one above work like magic tricks, cleverly masking the changes that occur during the switch between what are in fact two quite different images. Chances are, once you noticed the alterations to the webpage, they became almost impossible to stop staring at. What you just experienced is a phenomenon called change blindness: in order to notice the (not so) subtle alterations to our environment, our attention has to be consciously drawn to them. Change blindness occurs when a change in visual stimuli goes unnoticed, especially if our visual attention is not focused directly on the change. Change blindness pops up all over the place. In Luis Bunuel’s seminal 1977 film Cet Obscur Objet du Désir, two actresses were cast in the place of one, symbolically showing that the male protagonist could not understand “the true nature of his lover”. When the film first screened, many viewers (including this article’s author, truth be told) simply didn’t initially notice that the role of the intriguing Spanish vixen was played by two entirely different people. Why Does Change Blindness Occur? Change blindness occurs when a change in our visual field is not consciously “attended” to; our eyes are not expecting the change, so they don’t process it. Visual perception occurs on a two-fold level: First, the optic nerve transfers information about a physical (rather than emotional) change to the visual cortex at the back of the brain. Very soon after this information reaches the visual cortex (for lack of a better theory) subjectivity emerges. Your brain must decide, for example, if it’s seen a change in what it’s looking at, or if it is mistaken. In other words, the real mystery of the way we see things is to build a bridge between the information that the visual system gives to the brain, and how the brain transforms this information into experience. "Perhaps the most natural view to take is to suppose that what we have the subjective impression of seeing is not the very sparse, more semantically coded, content of visual memory, but the content of a shorter-lived but higher quality, image-like replica or "icon" of the visual scene. The impression of richness that we have from the world would derive from this high-quality icon. On the other hand, only a small portion of the icon's contents, namely the parts that have been attended to, would at any moment be transferred into memory and be available for doing tasks like change detection -- the rest would be forgotten. This view of visual processing has been called "inattentional amnesia" (Wolfe ): the idea is that we see everything, but forget most of it immediately." Just as in everyday situations, change blindness plays a role in the way we look at and understand websites. We may think that we are aware of all available information when we arrive on a web page, but the simple fact of the matter is that our brains can only take in so much at once. Back in 2010, UX magazine posted a brief article alerting UX professionals to the role of change blindness in UX; “What are we failing to capture when observing people using the products we design?”, queried the author. When optimizing a website, everyone involved makes hypotheses about what needs to change on a page; perhaps it’s the copy, a button colour, or a background pattern. Coming up with testing ideas is often based on intuition and experience, but even an experienced designer or optimization expert is likely to miss key problems. In fact, a study from the University of Copenhagen showed that experienced web designers could only predict how a user would view a website with just 46% accuracy. 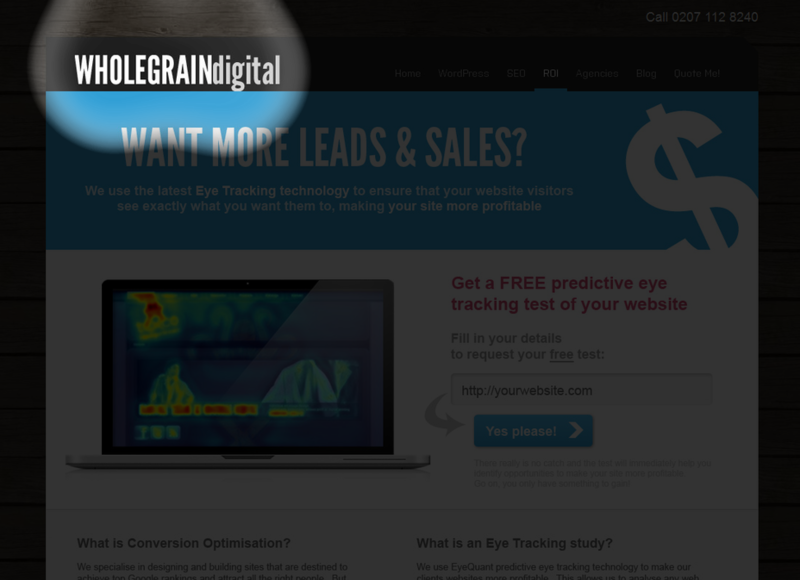 Predictive eye-tracking does an excellent job of solving this problem by removing subjectivity from the testing equation. Heatmaps and other visualizations show what users will initially see based on finely tuned algorithms and years of research - not subjective opinion. 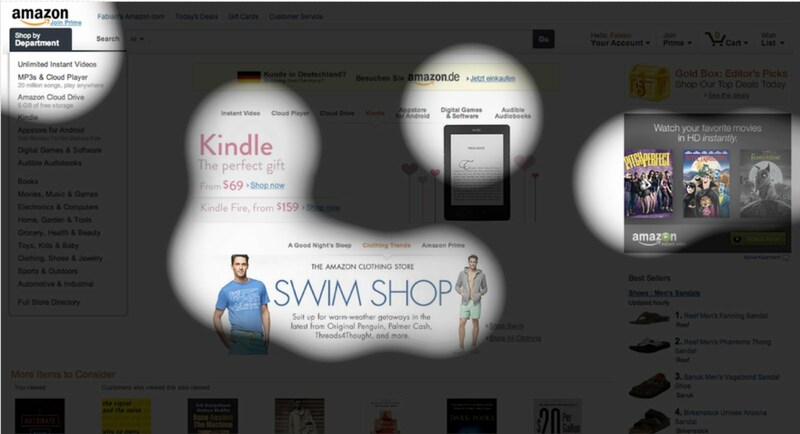 While three main areas of visual attention remain the same, the illuminated region to the far right changes dramatically with a simple change to the “best sellers” content on the bottom right, from mens’ sandals to beanies and hoodies. Suddenly, attention is pulled away from the grey box entitled “Watch Your Favourite Movies in HD Instantly”, and drawn downward. This is not because users are reacting more emotionally to beanies and hoodies than sandals, but simply because the former produces a larger block of dark colour, thus more easily drawing our eyes toward it. Herein lies the crux of this lesson: When testing design and content changes on a website, we tend to focus on a single element at a time, such as the colour of a CTA button or the size of a headline; however, the circumstances of change blindness (and the results of an EyeQuant test) show us that small changes to one element also change the way a user looks at anything around that element as well. When tweaking design elements, it’s crucial to consider not just the attributes of a single element, but how it will alter a user’s gaze on the entire page. 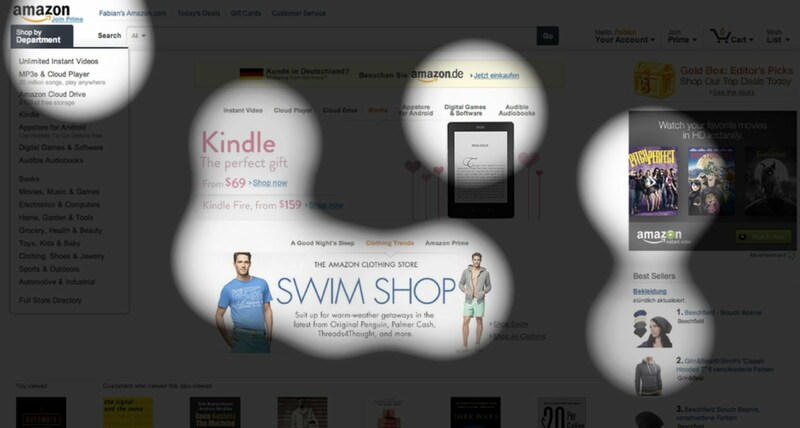 Will enlarging the headline draw user attention away from the product image on its left? Will moving the CTA from centre-right to dead-centre draw attention away from the core benefits? The best way to find out is to test, tweak, and re-test until you find the winning combination. 3. We humans aren’t very good at noticing details. If you want an element on your web page to be paid attention to, it needs to stick out right away. ...You have to draw their attention toward it. 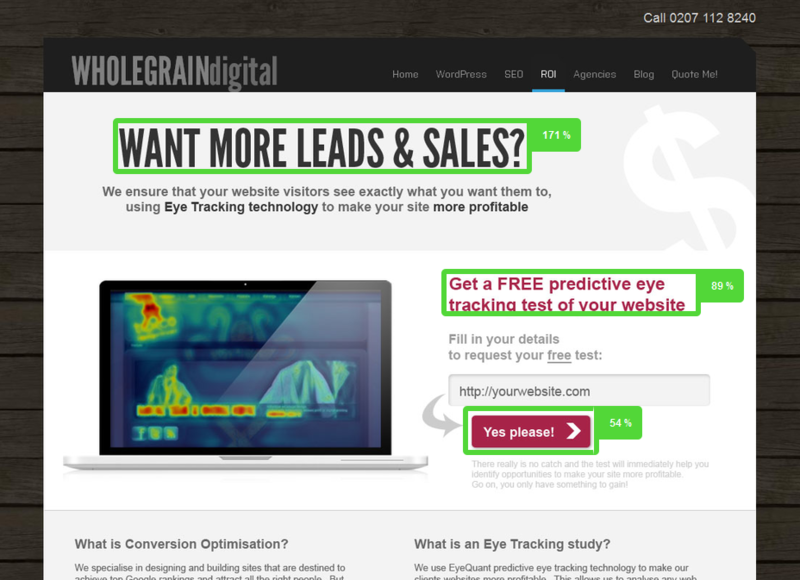 Test your website with EyeQuant to see what users see when they first arrive, and what they miss. 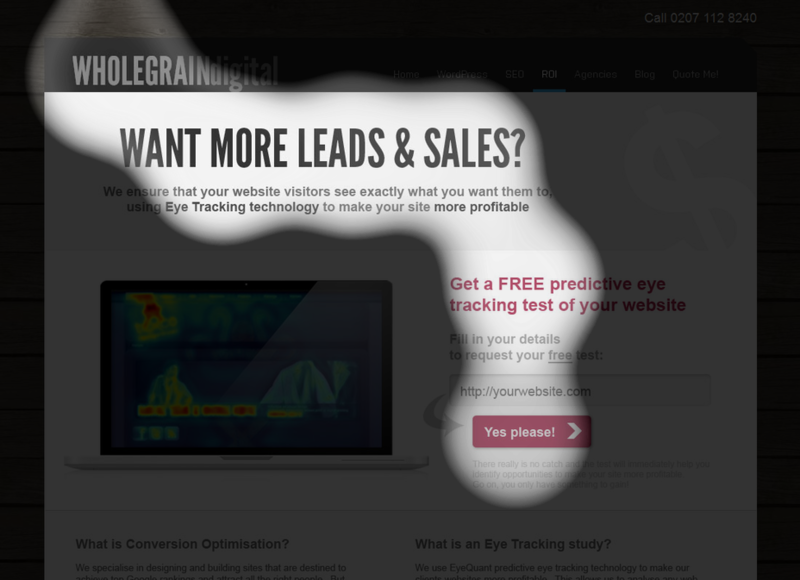 If the most important content on your site is not visible in the perception map or attention (heat) map, then you have some work to do. Instead of just focusing on single elements - like the placement, size, or colour of your CTA - consider tweaking the areas that surround it. Dull or alter the background colour, adjust the size of surrounding copy, or make some room around your most important elements. 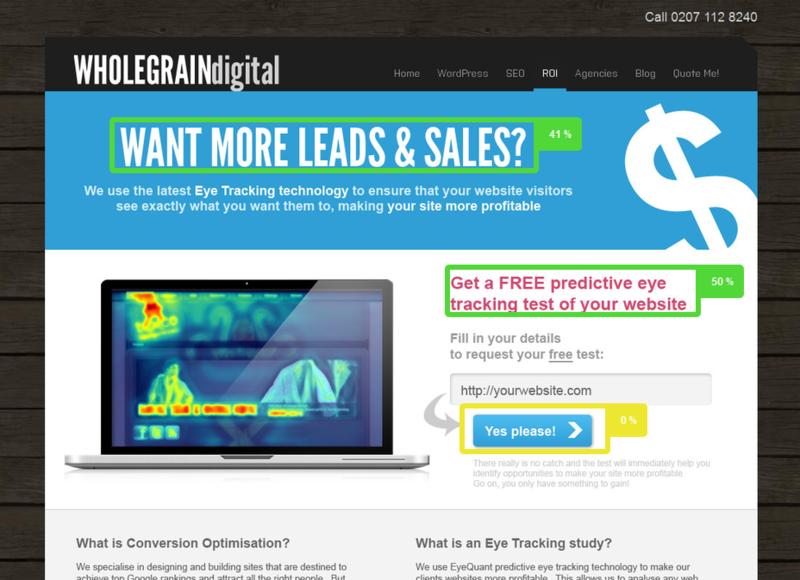 Plug your changes into Eyequant, test, rinse, repeat, and optimize.